Since the Banbury Camera Club moved to Chenderit School, Middleton Cheney, we have been able to take advantage of their wonderful facilities. This includes the Michael Heseltine Gallery, which has enabled us to mount an exhibition of member’s work to a professional standard for the fourth year running. As in previous years the exhibition is in support of a local charity, and this year Katherine House Hospice was chosen. This coincides with the Charity Sky Dive Andrew Lines has done to raise money for the hospice. The 89 prints in the exhibition were for sale (with some exceptions), the profits from the sale will be donated to the Katherine House Hospice, over a quarter of them were sold. This year there was a special commemorative display of the work of Isabel Smith, who passed away this year. Isabel was a long standing member of the club, awarded a life membership and produced many wonderful entries for the competitions. The exhibited photographs and belongings have been graciously loaned/donated to the club. In October the annual Exhibition opened for a week. 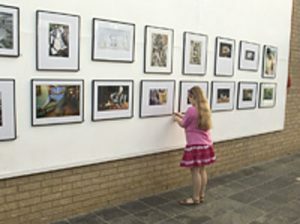 Everyone who came to view the exhibits during the week commented on the variety and quality of the photography and the display itself. There was a special open evening where Andrew Lines made his presentation of a cheque for over £750 to the Katherine House Hospice, and there was a ‘Best Picture’ competition organised and sponsored by Rosy Burke. Friends and family of the club members came to see the exhibit along with several local photographic professionals.